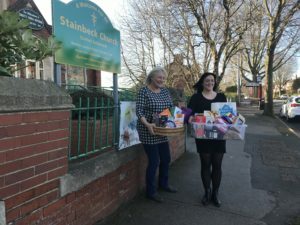 Maureen Lillywhite, a Local Community Worker for Stainbeck Church, said: “The reverse advent calendar is a simple concept where instead of opening an advent calendar window, you add one food or household item into a box per day from 1 to 24 December. You could add anything into the box, like tinned food, a toy, a packet of biscuits, shampoo, body wash or chocolates. Katie Nicholson, Primary Care Manager at NHS Leeds Clinical Commission Group, said: “I’d like to say a really big thank you to Maureen who works hard all year round working within communities in Leeds. In particular the work she does with those who struggle both before and after the Christmas period. She works tirelessly to make sure that as many people as possible receive something at Christmas whether this be a Christmas hamper, food and clothes donations, winter warmers for the elderly and toys for children all so that families and elderly who struggle don’t go without. I’ve added my thank you message on the Big Thank You website (www.bigthankyouleeds.co.uk), because she’s my unsung winter hero. “I volunteered to help Maureen with the reverse advent calendar because it’s a brilliant idea. I asked my work colleagues from the CCG to get involved in this and they were happy to support this. We’re looking at doing this again for this year’s Christmas because we’ve been overwhelmed with the number of boxes we’ve received.